US destined Orders ship from locations in the Midwest US. For orders shipping to the Canada, please visit our Canadian website at http://www.boardgames4us.ca. In ancient times immortal vampires played games with people's lives and with real blood stakes. Now in card game form no real blood will be spilled but the strategy tactics and power-plays still abound. 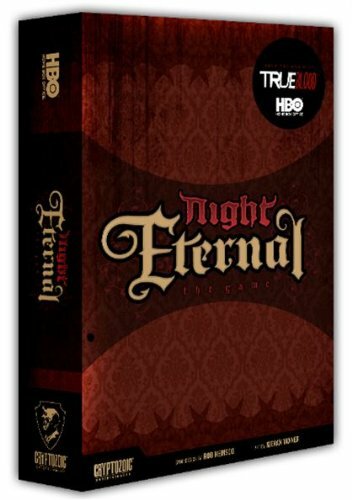 Based upon a game that exists in the True Blood universe True Blood: Night Eternal is a competitive card game of intrigue power-plays and betrayal where vampires jockey for power position and ultimate control of the rival factions: The Authority and The Monarchy.Players must ante blood from their pools to both factions each turn of the game. Players build up their hands by acquiring cards from a powerful but temperamental Immortals deck and a willing and able Agent deck. The cards that a player chooses to play will determine the faction to which he or she is loyal...for now. In turn order each player plays out one card (face up) during each of three rounds each turn so you never just how much power it will take to seize control of a faction each turn.Players must pay attention to the cards their opponents are playing. It's more difficult to enable a powerful card's special ability if your opponents are playing weaker cards. Weaker card special abilities are easy to resolve but weakness doesn't win the war. Special abilities might allow a player to steal blood from a faction or move it from one faction to another so switching your loyalty to a new faction (by playing cards of that faction) might just throw off your opponents' best laid plans.In the end power still rules the day. At the end of each turn (after three rounds of card play) the cards are scored. The player with the highest value of Authority cards earns that faction's blood pool. The player with the highest value of Monarchy cards earns that faction's blood pool. The key to victory is to have more blood tokens than any other player when the first player dies...by running outof blood.